Ever wonder what it would take to be a seat filler at the Oscars? Just think how interesting it might be to swoop in, dressed to the nines, and sit where, say, Jeff Bridges, a best-actor nominee for Crazy Heart, was perched a mere few seconds before. Regardless of whether the actor wins that coveted golden statuette, at some point, he is going to have to leave his seat during the ceremony. It may be to go onstage to collect the prize -- or for something as mundane as having to answer nature's call -- but at any rate, the producers of the mega-show cannot have an empty seat shown on camera. That's where you come in. Maybe. Surprisingly, it's harder than you might think to get that cushy seat-filler job! I lucked into it once: not at the Academy Awards, but at the Spike TV Scream Awards, where I was covering the event as a reporter. One of the actors in the first few rows had to go onstage to introduce Jared Leto's band, 30 Seconds to Mars -- and for whatever reason, the hired seat-filler wasn't around, so I was called into service. I applauded the band and beamed like I was their biggest fan as the camera panned by ... and sure enough, I wound up on TV. The "work" itself is like a hoity-toity game of musical chairs: At your supervisor's word, you sit in a seat until the celeb returns, pay rapt attention, smile and clap, then get up and wait for the next empty spot. Fancy dress and camera-ready good looks and grooming are a must. You should be between the ages of 18 to 29, and svelte. For those who vie for the job of seat-filler, especially for something as prestigious as the Academy Awards, it takes a little more doing than just being handy. In fact, as far as I know, it's mainly ABC employees and Academy members and staff who are used as seat-fillers for that particular event. People who already have a foot in the door, such as those who work as film extras, or even those with connections to the decorators, caterers and wait-staff, security, etc., are also more likely to snag openings. One needn't be an insider to sit in a seat Jeff Bridges has warmed -- because it's not just The Oscars that need ready cheeks; there are all kinds of big awards shows. Agencies are brought on to make sure no seat goes unfilled -- for The Emmys, the Critics Choice Awards, the Golden Globes, the CMAs ... the list goes on and on. Some of the best butts in the biz have worked the SAG Awards, the American Music Awards, the People's Choice Awards, the MTV Awards, The Grammys, and the Blockbuster Awards. While it may be an easy job that's not particularly easy to get, being a seat-filler isn't all it's cracked up to be: Some agencies don't pay at all (prestige is payment enough, apparently); you more than likely won't be fed or compensated for parking fees; you'll probably have to work your way up the ranks by doing smaller, less-interesting events at first; you are not allowed to speak to the stars you may encounter, much less ask for photos or autographs; there is unpaid training you must take part in; and there is an awful lot of waiting and standing -- as well as a lot of ups and downs (literally!). The main agencies handling the big events are Seatfillers & More and Audiences Unlimited. 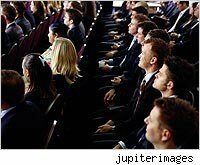 In Las Vegas, some temp recruiters hire people to fill seats so that certain concerts and magic acts don't appear unpopular. In those cases, you can stay for the whole show. You'll need to fill out an application, include your résumé, your photo, and check the Web site's job listings daily leading up to the events, but ... that's showbiz!